Book Description: The Information Directory lays out current events, opinions, and OER investigations related to open education in four categories: blogs, books, news, and research. It was created to fulfill the need for Canadian-based information, specifically British Columbia, on open education. However, the Information Directory also includes content from other English-speaking countries with chapters for the United States, the Global North, and the Global South.This directory is considered an ongoing resource and will be updated as information comes available. A “Last update” textbox is posted at the top of each chapter to clearly indicate when information was last added. The Information Directory lays out current events, opinions, and OER investigations related to open education in four categories: blogs, books, news, and research. It was created to fulfill the need for Canadian-based information, specifically British Columbia, on open education. However, the Information Directory also includes content from other English-speaking countries with chapters for the United States, the Global North, and the Global South. This directory is considered an ongoing resource and will be updated as information comes available. A “Last update” textbox is posted at the top of each chapter to clearly indicate when information was last added. 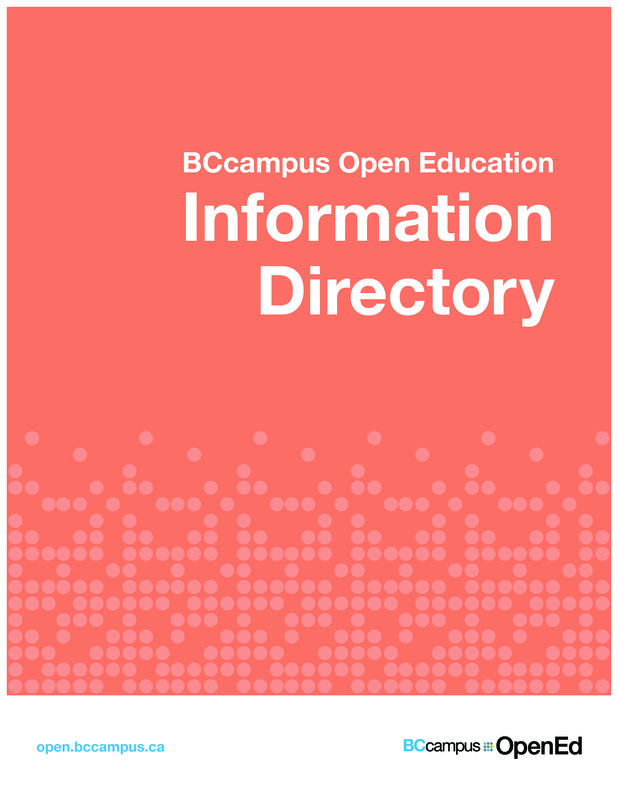 The BCcampus Open Education Information Directory by Lauri M. Aesoph is used under a CC BY 4.0 licence.